Book description: As the discipline of Holocaust studies matures, new questions and themes come to the fore. Among these are critical issues that receive serious scholarly attention, often for the first time, in this collection of essays by some of the world's most respected experts in the field. Greed and theft as motives for Holocaust perpetrators and bystanders; sexual violence and what it tells us about the experiences of both victims and perpetrators; collaboration with Nazis among the local populations of the ever-moving Eastern front; the durability of anti-Semitism after 1945; and the perspectives of the Soviet military and Soviet leadership on Nazi crimes: these are some of the topics the authors address as they extend the boundaries of Holocaust scholarship beyond the central loci of the planning and execution of technologized mass murder--Germany and Poland--and into ghettos and killing fields in Ukraine and Belarus, as well as spaces whose boundaries and national identities changed repeatedly. The authors also look to Western Europe and consider the expropriation of Dutch Jews and the exigencies of post-Holocaust filmmaking in France; they draw insights from recent genocides such as those in Cambodia and Rwanda, and provide new critical analyses of the course and meaning of contested responses to the Shoah in nations and locations long and deeply studied. A thorough, thoughtful, and insightful introduction clarifies the volume's themes and concisely places them within the larger context of Holocaust scholarship; and an introductory essay by Omer Bartov brings into focus the numerous paradoxes structuring early twenty-first-century retrospective thinking about the significance of the Holocaust as a central theme of the twentieth century. Rosenfeld, G. (2006) " The Normalization of Memory: Saul Friedländer’s Reflections of Nazism Twenty Years Later," in Dagmar Herzog, ed., Lessons and Legacies: The Holocaust in International Perspective, Volume VII (Chicago, 2006), pp. 400-410. 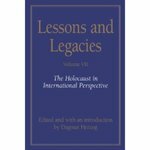 Herzog, Dagmar and Rosenfeld, Gavriel D., "Lessons and Legacies: The Holocaust in International Perspective" (2006). History Faculty Book Gallery. 13.